and the comfort of your residents? As more residents become High Care and less independantly mobile, Aged Care facilities are increasingly using comfort chairs. Floor surfaces are being replaced with carpet, making transportation of these chairs challenging. Busy staff are at risk of injury having to manually move residents around the facility. 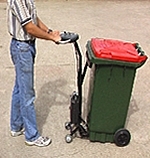 The Turtle Chair Mover is designed to assist staff in transporting residents with ease. No pushing required, just provide direction and the Turtle will do the rest! high quality product to alleviate these problems. The handle design on the Turtle Chair Mover is the same as our Power Drive system handle, so training your staff will be a breeze. Switch the machine on, adjust the speed and away you go! A fully automatic battery charger easily connects to a charger point located adjacent to the controls for charging the batteries at the end of each day. Combining our Power Drive hub motor and an easy to use chair grab system all in one neat, simple package, the Turtle Chair Mover provides a safe and stress free way of moving comfort chairs and trollies around for an operator. Tight spaces and narrow corridors can be easily navigated with the Turtle Chair Mover. The unique steering system allows almost on the spot turning ability, with no manual pushing required. all the while maintaining your resident in complete comfort.